This article first appeared as a feature on the website of the Cambridge Mathematics Faculty. Stephen Hawking was a larger than life presence in and around his academic home, the Department for Applied Mathematics and Theoretical Physics (DAMTP), which is also the home of Plus. His death on 14 March at the age of 76 has been an occasion to share memories of day to day life with someone who was far more than an icon: he was a colleague and a friend. As Anne-Christine Davis, Professor of Mathematical Physics, says: "We have lost not just a great scientist but a wonderful human being." Stephen Hawking at the Centre for Mathematical Sciences at the University of Cambridge. The impact of Hawking's work can be measured both by the scientific contributions he has made, and also in the effect he has had on generations of young physicists. "[As for] many of us, Stephen is the reason I became a physicist," says David Tong, Professor of Theoretical Physics at DAMTP. "Hawking has inspired generations of scientists," agrees Ulrich Sperhake, Lecturer at DAMTP on the occasion of Hawking's 75th birthday celebrations last year. "When Brief History of Time came out many of us were at the beginning of our careers. I still can't believe that my office is just a few doors down from the great man." 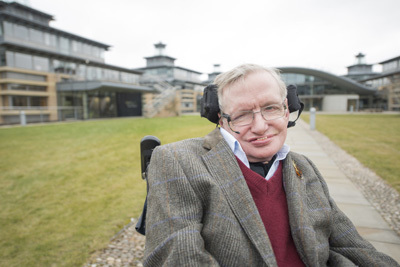 Seeing Hawking in the Department every day, hearing his voice drift down the stairs, was part of daily life for staff, students and Hawking's colleagues. His presence will be sadly missed by all. DAMTP was Hawking's home for most of his career. He came to Cambridge in 1962 as a PhD student, and rose to become the Lucasian Professor of Mathematics in 1979, a chair previously held by scientists including Isaac Newton, Charles Babbage and Paul Dirac. In 2009, he retired from this position and was the Dennis Stanton Avery and Sally Tsui Wong-Avery Director of Research in the Department of Applied Mathematics and Theoretical Physics until his death. "Stephen was one of the greatest scientists of the 20th century and the natural successor to Newton and Einstein in the field of gravitational physics," says Davis. Professor Tim Pedley remembers when the Queen came to open the new Centre for Mathematical Sciences in 2005. Pedley was then Head of Department and was escorting the Queen into the building and introducing her to people. But when they came to Hawking's office no introduction was needed: "She said, 'Oh I know him!'. It's sad to lose somebody who has meant so much to the department by being himself and being here at DAMTP," says Pedley. Hawking was a sociable and gregarious member of the department, who placed huge importance on interacting with his colleagues. "Stephen was a former student of Dennis Sciama, and Sciama always used to say that it was more important to go to coffee than to go to seminars – it's where you'll meet everyone that you need to talk to," says John D. Barrow, Professor of Mathematical Sciences (who was also supervised by Sciama). Hawking regarded informal interaction as such an important part of the life – and work – of the department that he sponsored the daily communal coffee break for members of his research group and others. 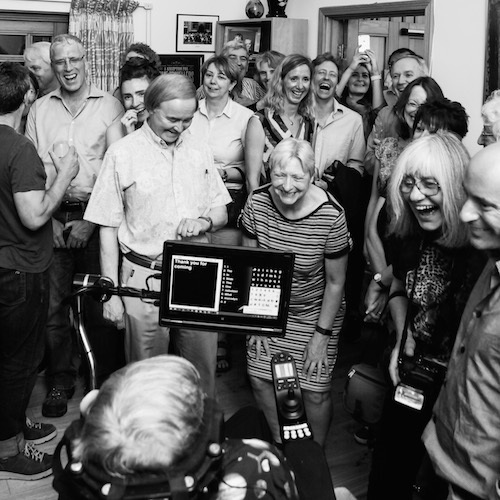 When he was awarded the Milner Foundation's Fundamental Physics Prize in 2013, Hawking invited the whole department for impromptu champagne and cake in the common room. Throughout his career, whenever Hawking was in Cambridge he would be in the department, and he was a constant presence in the central common room, in seminars and at coffee time. Hawking is remembered fondly by colleagues for his wit, humour and enjoyment of life. He was always keen to attend, and give, parties and was well known for joining the dance floor. "There was a disco, and us (then young) postdocs were dancing, and Stephen had the bike lights on his wheelchair fixed to 'flash' and came and danced with us," remembers Ben Allanach, Professor of Theoretical Physics. "Stephen really enjoyed being the centre of attention, and had a wonderful way of doing that," said Pedley. His sense of humour and fun also extended into Hawking's work life. He was famous for making bets about various cosmological phenomena, such as his bet in 1997 with Kip Thorne against John Preskill that information was lost in black holes. Hawking conceded the bet in 2004 and duly presented Preskill with the prize of an encyclopaedia of his choice, from which information could be retrieved at will. But Hawking's resolution of the information paradox showed that, while information was not lost, it was returned in a mangled state that was not easily recognised. "I gave John an encyclopaedia of baseball, but maybe I should have just given him the ashes," Hawking wrote in his paper Information loss in black holes.